You never know what is hidden under a beautiful mask. 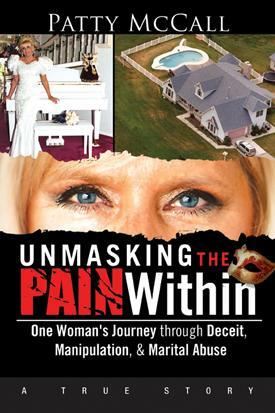 On the outside, this family appeared to have the American dream…but behind the doors of the eight-acre estate were broken promises, lies, and deception. Patty was a devoted wife and loving mother of three that kept the pain within from her children and hid the shame of abuse from the small town they lived in and where her husband had grown up. Through her courage and spiritual guidance she maintained a convincing mask of peace for the world to see. Arnold was a handsome, athletic man with a charming but deceiving personality. Few, including Patty, had seen Arnold’s darker side—a cross between a con man and a sociopathic manipulator with uncontrollable behavior. Together, they built a multi-million dollar cable TV construction business. But it wasn’t until their business began to crumble that Patty learned of Arnold’s hunger for money, lust for women, and the trail of fraud and embezzlement. With deception and manipulation, he increased her life insurance policy. He put into action a scheme to poison her and planned a fatal accident in the Colorado Mountains.